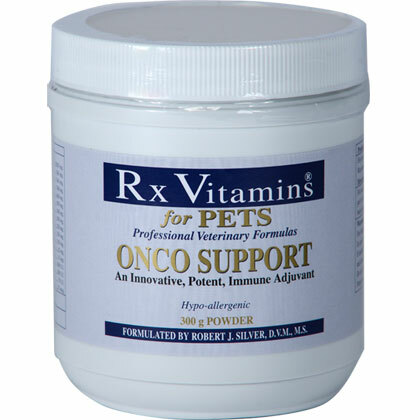 RX Vitamins Onco Support Powder & Supplement for Pets is used to support the immune system of dogs and cats. Created by veterinarian Robert J. Silver, RX Vitamins Onco Support Powder & Supplement for Pets is hypo-allergenic and made in a powder form that is easy to administer, just add it to your pet's food. This immune support supplement contains vitamins A, E, and D, along with other vital nutrients that pets need to have a healthy immune system. RX Vitamins Onco Support Powder & Supplement for Pets comes in a powder form that can be mixed in right with your pet's food. RX Vitamins Onco Support Powder & Supplement for Pets is hypo-allergenic, which means even pets with allergies can take it. It contains vital nutrients from vitamins and minerals that help keep your pet's immune system healthy. Safe use in pregnant animals or animals intended for breeding has not been proven. For Animal Use Only. Keep out of reach of children and other animals. In case of accidental overdose, contact a health professional immediately. If animal's condition worsens or does not improve, stop product administration and consult your veterinarian. For each 50 lbs. (22.7 kg) of body weight, administer 1 scoop of the powder daily or as prescribed by your veterinarian. Higher doses have been associated clinically with increased formula efficiency. If you are unsure about how much your pet should be receiving, consult your veterinarian.